ORLANDO, Fla. (IBS Booth #W3440) January 12, 2017 – If 2016 was about blurring the lines between the indoors and out, 2017 is the year that erases it completely. The newest designs in outdoor living spaces do not simply feature the look of the indoors – but the functionality as well. This overarching trend has not gone unnoticed by builders, architects and industry analysts. In fact, the American Institute of Architects reported in its 2016 survey that 69 percent of firms surveyed have seen an increase in demand for functional outdoor living spaces. * With the outdoor living market expected to top $7.1 billion by 2020**, Trex Company has once again compiled the expertise of its “Trexperts,” Paul Lafrance and Kate Campbell of HGTV’s “Decked Out” series, to offer a glimpse at how this trend will take hold in the coming outdoor living season. While grilling and al fresco dining are long-time hallmarks of backyard entertaining, food prep necessities and the need for other cooking equipment often necessitated the use of an indoor kitchen – until now. Outdoor kitchens are finally living up to their name, with fully-appointed and fully-integrated work stations outfitted with appliances, storage and all the related conveniences. Among the newest advancements is outdoor cabinetry that blends interior style with durability to withstand the elements. Functional elements such as trash bins, ice chests, storage drawers and cabinet components eliminate the need for back-and-forth trips inside the home. This season will see the introduction of high-performance sink cabinets and grill bases to hide plumbing and gas hook-ups for a completely finished look. Even railing – long regarded for its ability to add safety and beauty to an outdoor space, has taken on a more functional role in today’s backyards. Set to launch just in time for the 2017 outdoor living season, Trex® Signature™ railing is an ideal choice for creating this on-trend application. Simply pair the stylish aluminum railing with a deck board top rail to create a mixed-material look that adds both style and functionality. Lighting is another “bright” idea for adding versatility to the outdoors, and is one of the most requested “add-ons” from homeowners during the deck planning process, according to Lafrance, an acclaimed professional deck contractor who designs and builds dozens of decks each season. Lafrance recommends that homeowners steer clear of the dreaded, garish corner spotlight, and instead install a mix of landscape and deck lighting features, such as path lights to brighten walkways, well lights to illuminate foliage and small structures, riser lights incorporated into deck stairs and recessed deck lights – inserted directly into deck boards – for subtle dots of light to accent the deck’s design. The idea of enjoying your favorite show or movie outdoors has always been enticing, but not exactly practical. However, with advancements in both equipment and equipment storage, enjoying the big screen experience in the great outdoors has never been easier. Just because people are spending more time on their decks doesn’t mean they’re willing to put in extra hours for maintenance. Instead, their desire for comfort with functionality extends to the decking material itself. Wood alternatives, particularly wood-plastic composites, are expected to experience above average annual gains in demand through 2020. As the economy rebounds, analysts predict this segment of the decking industry will grow at a faster rate than traditional wood** – and for good reason. Unlike wood, composite decking, such as Trex®, resists fading, staining, scratching and mold – and won’t rot, warp, crack or splinter. No sanding, staining or painting is required, and food and drink spills wash off easily with just soap and water. Additionally, Trex decking is made from 95 percent recycled material, making it an environmentally friendly choice for eco-conscious consumers. In addition to its functional elements, the latest generation of composite decking features high-definition wood grain patterns and rich, saturated colors that look and feel more natural than ever before. Color options range from deep earth tones to spicy reds and pristine greys, including tropically-inspired boards that feature the distinct streaked look of exotic hardwoods. To view examples of outdoor living settings featuring this year’s top trends, visit Trex’s Inspiration Gallery at www.trex.com/inspiration/gallery. 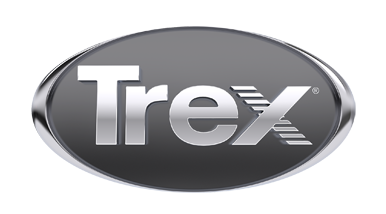 For more information about high-performance Trex products, go to www.trex.com. *American Institute of Architects 2016 Home Design Survey, http://info.aia.org/AIArchitect/2016/0617/aia-interactive/index.html#!